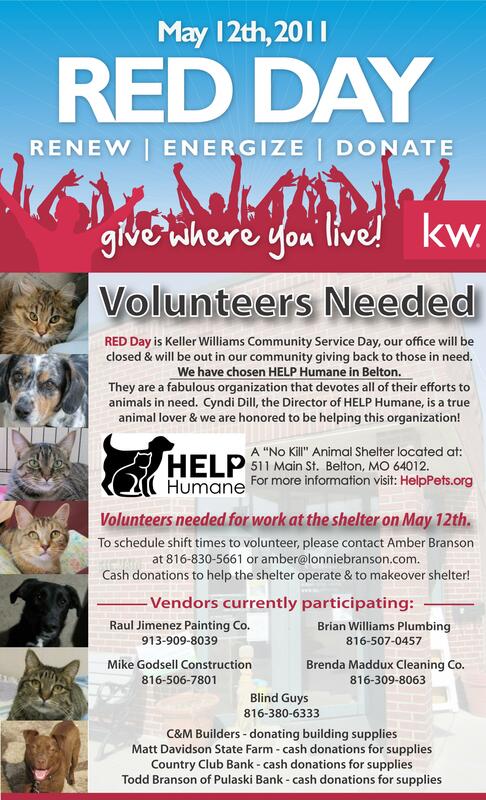 Please let us know if you have any of these items available to donate for the shelter makeover May 12th. We are also accepting cash donations and Home Depot or Lowe’s gift cards to purchase the remaining supplies that we cannot get donated. Thanks so much to everyone who has already offered money and supplies! This makeover is going to make a world of difference for the people that spend every day tireless rescuing and finding homes for our animals. The shelter will also make a much better impression on all who enter. 1. Paint supplies- rollers, roller skins, paint brushes, drop cloths and cut in tape (painters tape). 3. Either Kilz in spray can or ceiling panels to fix stained ones in the ceiling. 6. 2- 3” binders and clear sheet protectors. 13. Desk for exam room, so that the other furniture can be tossed, It doesn’t work to store papers and to make that room functional. It’s a good thing Amber Branson rarely takes “no” for an answer. The Belton woman’s latest mission comes as a result of her husband’s sales position with Keller Williams Realty. Lonnie Branson joined the firm a couple of years back, and Amber watched as local agents rallied on “RED Day” to gather volunteers and supplies to spruce up Belton’s Head Start headquarters. The name of the annual May event, a staple for Keller Williams offices nationwide, represents “Renew, Energize and Donate.” Each year, on the second Thursday of May, tens of thousands of Keller Williams associates from across the United States and Canada take the day off, devoting their time to a wide range of projects, renewing and energizing aspects of the neighborhoods in which they work and live. So for this year’s project, set for May 12, the company’s new KW Cares Charity Coordinator directed her energy toward what she saw as the most immediate need. And with her love for cats, the choice was a natural once she was put in charge of organizing RED Day on a local basis. With project day more than two months away, there’s more than enough preparation needed to ensure the commitment’s success, she said. To that end, she has lined up local businesses to donate supplies, skilled labor and cash, and is seeking more. In addition, she has lined up the cleaning service she uses for the rental units she operates, Brenda Maddox; construction services and supplies from C&M Builders; a plumber, Brian Williams; and an electrician, Mike Godsell. Cash donations have come from such sources as Matt Davidson of State Farm Insurance in Raymore and Bryan Mallory of Country Club Bank in Raymore. Uncaged, the cats roam free throughout most of the facility, sleep in their chosen favorite spots and climb the cat trees. Directed by Cindi Dill, the shelter established itself at its current location in 2005, and houses dozens of cats and kittens. Branson can be reached at 816-830-8661, or by email at amber@lonniebranson.com.